Where to find Faro hotels near an airport? 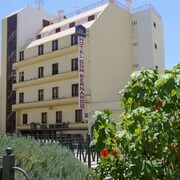 Where can I find hotels in Faro that are near tourist attractions? From the cheap and cheerful to the more upmarket, Faro offers a terrific range of comfortable hotel and apartment choices. 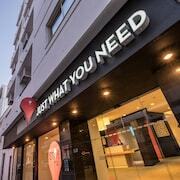 On our handy database you'll discover 28 hotels within a 0.1-kilometre (0.06-mile) distance of Faro's heart. Travelers looking for Expedia-listed hotels and accommodations not far from the center of Faro, should check out the latest offers at the Hotel Eva and Hotel Faro. If you are planning to book accommodation located within a short walk from the Carmo Church, the Hotel Sol Algarve and the Stay Hotel Faro Centro are popular choices. The Hotel Sol Algarve is 0.3 kilometres (0.2 miles) away and the Stay Hotel Faro Centro is 0.4 kilometres (0.3 miles) away. Those traveling on a budget will be happy to know that there's a nice selection of lower-priced hotels in the vicinity of Faro. The Alnacir is 0.9 kilometres (0.6 miles) from downtown, while the ibis Faro Algarve is 3 kilometres (2 miles) away. 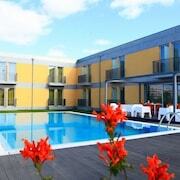 The Best Western Hotel Dom Bernardo and the Hotel Mónaco are some other lower-cost options worth investigating. 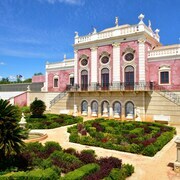 The Pine Cliffs Residence, a Luxury Collection Resort, Algarve is located 25 kilometres (15 miles) from the center of Faro. Alternatively, the Hotel Quinta do Lago is located 8 kilometres (5 miles) away. More accommodation options around this area are the Conrad Algarve and the EPIC SANA Algarve Hotel. Looking for more things to do? Spend a few hours exploring Falesia Beach and Vilamoura Marina, which you'll find in Vilamoura, 18 kilometres (11 miles) to the west of Faro. The As Cascatas Golf Resort & Spa and The Lake Resort are some of the Expedia-recommended short and long-stay alternatives in Vilamoura. 40 kilometres (24 miles) to the west of Faro, is Armacao de Pera, which is home to the Vila Vita Parc Resort & Spa and Vilalara Thalassa Resort. The Cova Redonda Beach and Trilhos do Algarve are just a couple of the more popular sites to check out should you visit Armacao de Pera. For those travelers planning on arriving through Faro International Airport, you may find it convenient to book some accommodation at Hotel Aeromar, or Hospedaria Frangaria, both of which are a short drive away. 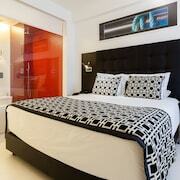 What are the most popular Faro hotels? 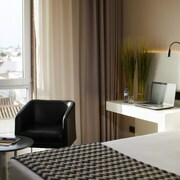 Are there hotels in other cities near Faro? 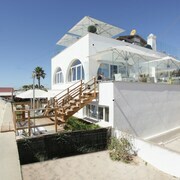 What other types of accommodations are available in Faro? Explore Faro with Expedia.ca’s Travel Guides to find the best flights, cars, holiday packages and more!